#4: Is Borderline Personality Disorder Caused by Faulty Genes? In this article I attack several commonly held, but false beliefs about BPD, including the ideas that borderline conditions cannot be cured, that BPD is partially caused by genes or biology, and that BPD is a real medical disease. This article argues that BPD should be abolished and replaced by an approach called “Formulation” in which people are understood as unique individuals telling their own stories of distress, not patients who “have” an illusory BPD illness that is causing their “symptoms”. 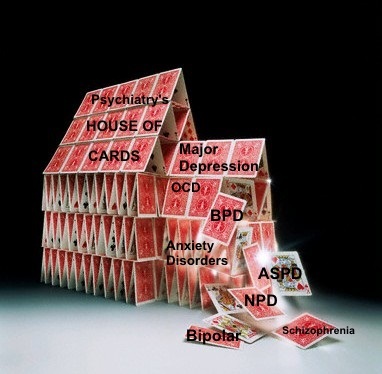 – My satirical spoof of how the psychiatric search for genetic foundations of “mental illness” is totally bankrupt and a metaphorical return to the days of the dinosaurs. I strongly disagree with your premise this BDP should be dismissed as not useful. My first introduction was in therapy dealing with a past bad marriage and a current one, when the therapist offered me a book “Borderline” by James Masterson. It was a fast survival read of familiarity and I see in your comments issues of looking for simple DSM parts of the object when this is a very complex issue similar to diagnosing “lead poisoning”. I was able to deal with it from having Electronic/Mechanical training and experience in Advanced maintenance in the Navy with complex aviation electronics. On recovering BDP: Looking at the two women I married, I realized I had married my mother and should have had BDP myself. As I have gone along 69 years on my path, have had NDEs and a conversation with that larger than I that got me out of a waterfall vortex when all my senses were nulled out. Doing Holotropic Breathwork, discovered in the Perinatal experience that I was stuck in the second phase of starting into the birth canal. Two historical facts to support the NDE conversation that I remember making a choice to be born; One was both parents recognized I was born blue because the doctor had my birth delayed while busy with another. Second, I was born with a double hernia as a result of my efforts. This was revealed in two journeys, the second in Holotropic work and the documents of others with similar life affects. What I am saying is that I got an object relationship with a power that has gotten me through the mine field of both marriages, a mine field I didn’t know I was in until long after the fact and revealed by coincidences. I see and describe BDP with an eclectic and related systems that served me well in trouble shooting both technology and personality, including introspective into wholeness resolving paradoxes. When I finished reading the book “Borderline”, by James Masterson, it was laying on a chair (I can see it now and recall the conversation). My wife’s youngest brother had just got a medical discharge from the Navy out of Boot Camp. He saw the book and said; “I know what that is!” He was diagnosed as Borderline in the Navy and was his medical release. Hope this is helpful for an epidemic result of our “dynamic – engineering term of many variable – most simple in Mechanical Engineering with contrast from “Static load” of a car parked on a bridge to “Dynamic load” with the car in motion over the bridge. A child freezes in personality development by trauma like abandonment (Masterson). There are a variety of adaptive methods to build a mask for social interface, like Darth Vader. When a crises during adult years with a developed mask (helping profession to learn the act for the mask) is threatened with a crises like ‘job loss – mask not prepared for situation- the mask drops exposing the 3 year old with adult weapons to act out with; which the dropped mask is “crossing the border from a mask of social acceptance to the other side of the border of a child coping with adult weapons. I often use TA Transactional Analysis to listen for the “use of emotions” to “the experience of emotions” as a clue. Extreme detachment from the person is demonstrated by pain to know one is alive as is common with Tattooing for example. I had gotten away from this awareness until this President Trump put the issue front and center. It is not a subject I enjoy, like being aware of or experiencing. Recently I recommended “Stop Walking on Eggshells” to a mother after hearing of her concerns with the woman her son is dating. She read it and recognized the similarity; while still feeling ineffective to improve the situation that was affecting and effecting her. So what in your experience is the way toward healing for those diagnosed as BPD?